Dissolved Oxygen measurements are important when making your compost teas for foliar spray, and in fish farms and ponds, where Oxygen levels are continuously monitored to obtain optimal reproduction. 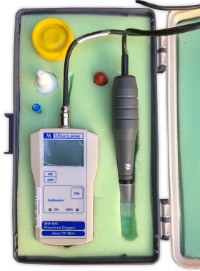 A Rugged Carrying Case (Optional) provides handy on-site meter calibration and measurements. MW600 is supplied complete with a MA840 D.O. 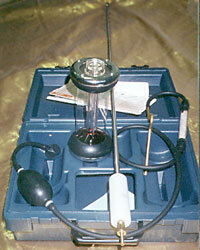 polarographic probe with 3 m cable, calibration screwdriver, 2 spare membranes, MA9071 s (30 ml) electrolyte solution, battery and instructions. Carbon Dioxide Meters & Long Probes are available at an affordable price for measuring CO2 in compost can also be used for CO2 in cold rooms etc.